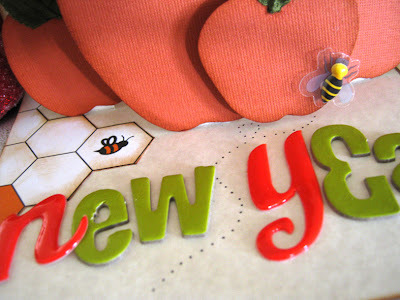 scrappin it: Happy New Year! Today Jews around the world celebrate the beginning of the New Jewish year: Rosh Ha-Shana, which literally means "the head of the year". This year we celebrate the beginning of the year 5772 (long time…). It is customary to eat an apple dipped in honey, a symbol of our wish for a sweet happy year. 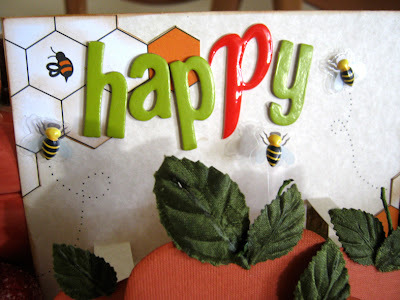 Another custom is to greet each other: Shana Tova which means Good year. My happy New Year card has yummy apples and honey bees flying around their hive. I want to thank all of you for a wonderful, exciting year. You all gave me support, encouragement and love. May you all have a happy new year! Health, happiness, love and successes! I don't know if you saw on my blog, but I made honey cake for Rosh Ha-Shana and mailed them to friends. 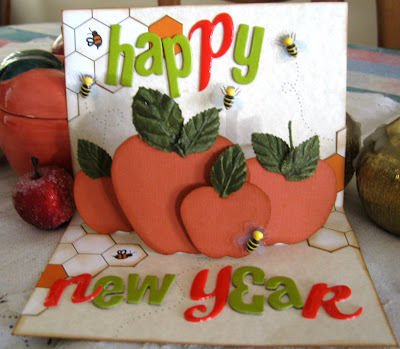 The apples and honey is a lovely tradition, enjoy your New Year celebrations. such a cute card. Shana Tova. 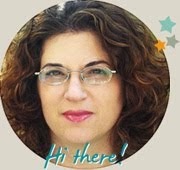 שתהיה לכם שנה טובה ומאושרת. Happy New Year to you and your family. May all good fall upon you. Your card is darling.